The new synthetic turf field will include a large crest, promoting the district’s commitment to academia. EDINBURG, Texas (December 7, 2012) - Edinburg Consolidated Independent School District has recently recruited Hellas Sports Construction to upgrade their synthetic football field with Hellas’ proprietary Matrix® Turf, but this field will feature something different than most. The artificial grass field, currently utilized by four 5A high schools as the game field, will soon feature the district’s large academic crest at centerfield – a large symbol of Edinburg CISD’s strong commitment to academic excellence. Academics and athletics are seldom thought of together, so the decision by district influencers to include the crest makes a large and colorful statement: academics are just as important as athletics. In addition to Edinburg High School, three other high schools utilize the field: Edinburg North, J. Economedes and Robert Vela High School. The district has over 33,000 students, of which, 5,000 are student athletes. The dynamic nature of this project is no challenge for Hellas, who is designing the synthetic turf field in conjunction with the Edinburg CISD District Architect. 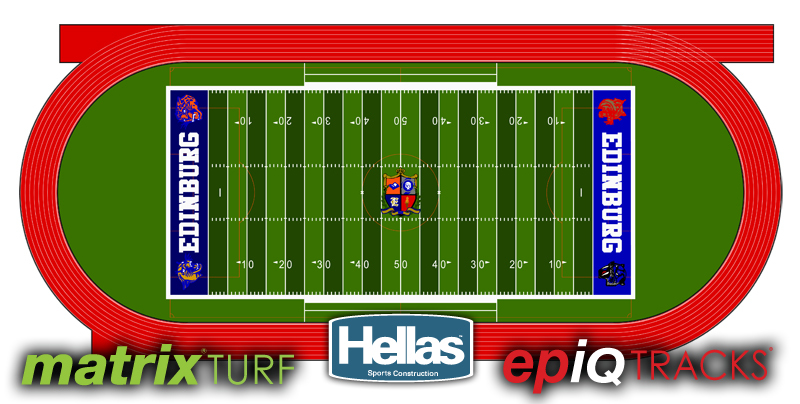 In addition to the inlayed academic crest, the new Matrix Turf field will feature logos from the four high schools split between the opposing end zones – two in each. All in all, the field ranks among the top of the hundreds of fields Hellas Sports Construction has completed for most color variations with thirteen unique colors! The crest alone has ten individual colors, and every five yards, the turf will alternate shades of green to give the field a more natural look. Perhaps a tall order for some sport contractors, but because Hellas is vertically integrated, accommodating unique and time-sensitive requests is nothing new. The district has also hired Hellas to resurface the running track and set a deadline of February 1, 2013. Crews have already begun working on re-surfacing the running track with Hellas’ proprietary epiQ TRACKS™ S200. According to Hellas Sports Construction’s Project Manager, the synthetic turf will arrive later this month and the field replacement will complete in early January. “Our turf and track project is starting on time as scheduled. Track crews reported to our stadium site on Tuesday and are doing preliminary work now. We are excited and looking forward to the completed project,” said Joe Filoteo, Jr., Edinburg CISD’s Director of Athletics. Hellas Sports Construction has a strong reputation for on-time and on-budget delivery of sports construction projects. The Austin-based company also specializes in manufacturing synthetic sport surfaces for field sports, running tracks and tennis. Hellas controls all business operations from their corporate headquarters to deliver quality athletic surfacing products directly to customers. For more information visit: http://www.hellasconstruction.com.